This outfit has a lot of craziness going on from denim overload to that crazy dog collar looking necklace but you know what, I kinda like it. 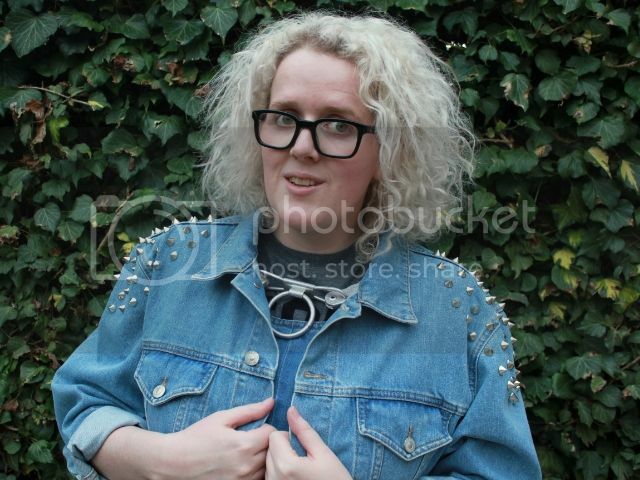 ASOS describes this jacket as oversized, I would describe it as vastly oversized as you need to size down at least twice for this to fit decently, however I love the stud detailing even if it does look a bit of a hipster cliché. Another pair of new tights in the form of these spotty wonders, I really like them and unlike other pairs of spotty tights I've had in the past they don't feel like they're about to ladder any second. I like the shape of this dress, it reminds me of something I would have worn as a kid as the swing style is perfect for spinning in circles, despite it being so roomy I think teaming it with a somewhat fitted jacket helps bring more shape to the outfit. Don't think I'd get away with wearing this to work even though there isn't a dress code but it was the perfect weekend outfit for traipsing around London. I'm off to Paris on Friday and I really need to get packing! 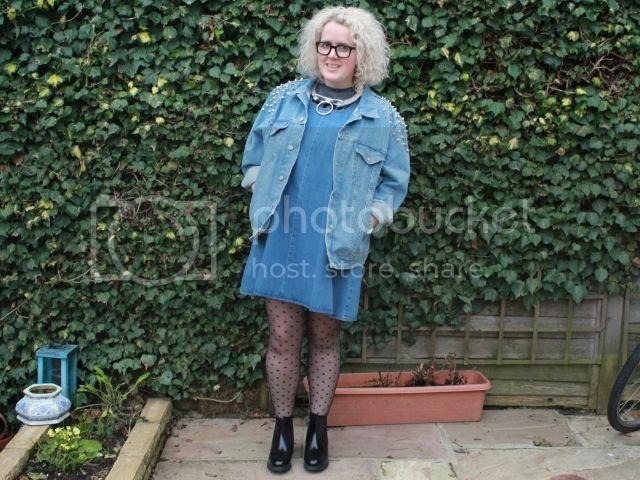 Loving the double denim!! 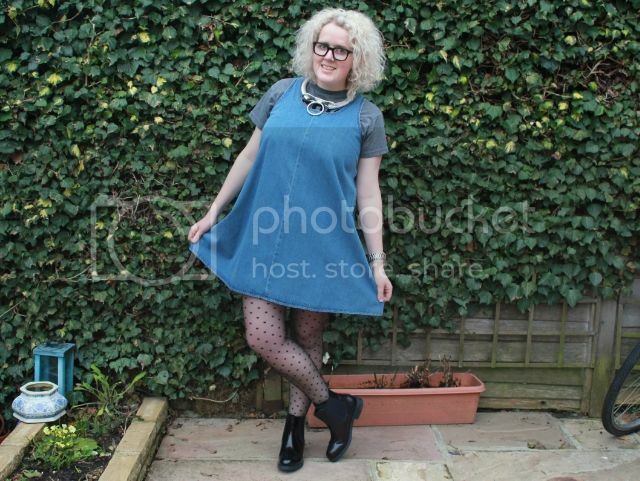 I actually tried that dress on in topshop recently because I really liked the look if it, but then decided that the 'bagginess' didn't really work for me. You wear it well though! 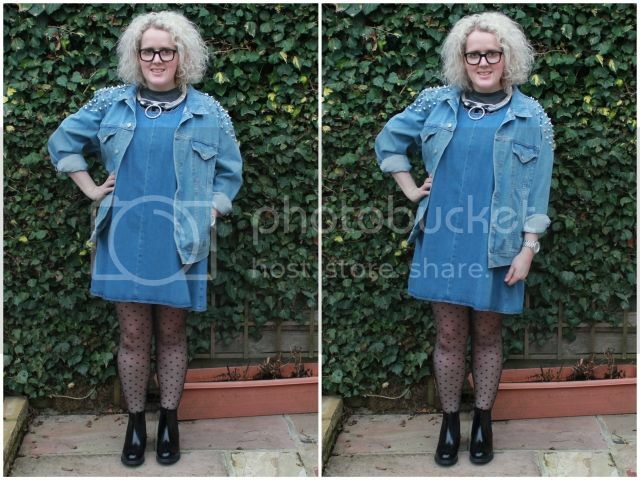 Have fun in Paris- double denim makes me happy! I love the dress I hate buying oversized things as they're never oversized enough :( your the second blogger wuth that choker and I'm now 100% a fan! Let us know how the tights hold up, I go through so many pairs of spotted tights, as they just seem to ladder instantly. It'd be great to know if you found a good sturdy brand for them. I'm loving the necklace, very cool detail. In love with this outfit and I love your necklace! Im a graphics design and I would like to make something for you for your blog if your interested ? I love this dress, have fun in Paris!